There are plenty of uses for augmented reality, and more are on the way. At the 2018 Robotics Summit and Showcase in Boston this week, several hundred conference attendees made their way through the exhibits involving all things robotic, from the hardware that comprises various forms of working machinery to the AI and software that helps robots learn as they go. One display in particular caught my eye, primarily based on the attendees’ reactions. Boston Engineering’s Advanced Systems Group was showing what, in effect, is a sophisticated underwater drone used by the military to remotely inspect such things as the bottoms of ships as they might enter a harbor. Ben Carson, client relations executive at Boston Engineering, told me that the underwater robot could work as it is tethered to a central point, such as a boat, or move through the water independently on an assigned task. The presentation included a professional, detailed video of the vehicle moving through the water. No matter how good the video was, all the focus was at the other end of the table, where an augmented reality experience of the device was in action. 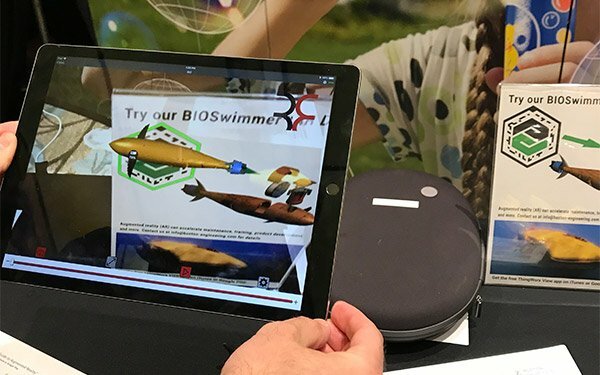 Using some very slick AR software from Boston-based PTC, Boston Engineering was showing how aiming a tablet camera at a diagram triggered the AR so that the underwater device came alive. The AR demonstration showed the various components of the underwater drone being disassembled, much like PTC demonstrated at its annual LiveWorx Tech conference last year how a piece of industrial machinery, like a generator or a tractor, could be diagnosed and repaired in the field using augmented reality. In the case of Boston Engineering’s Autonomous Underwater Vehicle, with the latest IoT acronym of AUV, the video was very well done and totally descriptive. However, the attendees lined up several people deep to see the augmented reality version. People waited in line to personally try the AR demonstration. People were being sold via the augmented reality experience. No one was watching the TV demo.